SpacePak, the total solution for central cooling and heating in ANY home or small business; regardless of structure design, age, size or type of construction. SpacePak’s compact flexible design is the perfect central comfort solution for any application. Address: 260 N. Elm St.
As the innovator of small-duct, central air conditioning systems, SpacePak delivers uniform, year-round comfort, with fewer of the unwanted challenges common to other central heating and air-conditioning systems. 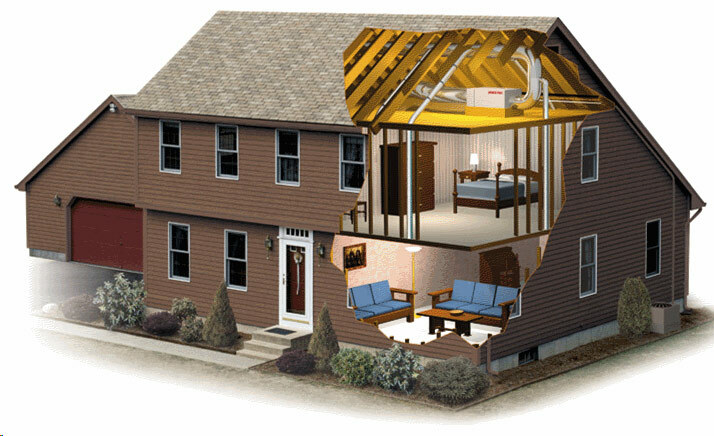 No major renovations, loss of usable floor space, high energy bills, or unsightly components; simply quiet, cost-effective comfort for virtually any home or small office, regardless of the structure's design, age, size, or construction type. The basic difference between SpacePak and other air conditioning systems is the way SpacePak actively circulates air within the room and throughout the structure’s entire living/working space. Circulating the air more effectively is what makes a home with SpacePak central air so uniformly comfortable: no cold or warm spots, no drafts, and up to 30% more humidity removed. Conventional central air systems merely drop cold air in at the ceiling; the distribution of cool air is haphazard, leading to over-cooling in some spots or drafts in others. Window air conditioner units or mini-splits require noisy fans within the living space to blow the air around, and there is no overall circulation of the home’s air. A central heating or cooling system designed to actively circulate air can use smaller ducts than conventional systems; 2 inch mini duct insulated supply tubing keeps the air moving consistently—like pouring water from a pitcher. This smaller duct allows SpacePak to use flexible tubing to distribute the air instead of bulky sheet metal ductwork. This tubing is seamless, so it doesn’t waste energy through leaks like sheet metal. And it’s flexible, so passages have no corners to accumulate dust, pollen, or mold. The tubing’s narrow diameter allows it to be placed in the spaces behind walls, floors, and ceilings: it can be installed with virtually no disruption to livable space, nor to interior architectural features.